Fireblock - ProPink ComfortSeal™ Gun Foam is ICC-ES Evaluated for Fireblock applications (ESR-3253). Window & Door – ProPink ComfortSeal™ Gun Foam is tested to AAMA 812-04 for low pressure build. 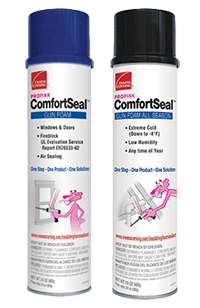 Air Sealing – ProPink ComfortSeal™ Gun Foam makes air sealing quick and easy with high volume 24oz cans and reusable one component polyurethane foam dispensing guns. Extreme Climates – ProPink ComfortSeal™ Gun Foam All Season will cure in low humidity environments and temperatures below 0°F while providing a high flow rate due to the low viscosity and robust formulation. Multipurpose cleaning agent – ProPink ComfortSeal™ Gun Foam Cleaner is used to dissolve uncured or fresh polyurethane foam and adhesive. To download product documentation, click on the icons above. Documents are in Adobe PDF format.